The episode picks up the moment last week’s tease left off before flashing back to show us Korra’s mental, emotional, and even spiritual journey over the last three years. Wow does it deliver some of the best material the show has ever seen. Korra has been down a long road and amidst her travels has discovered she’s being chased by some sort of ghost of her former self. After losing the underground fight, she sees a specter and begins chasing it through Republic City. While Korra is out chasing ghosts, we witness flashbacks recounting her journey so far. 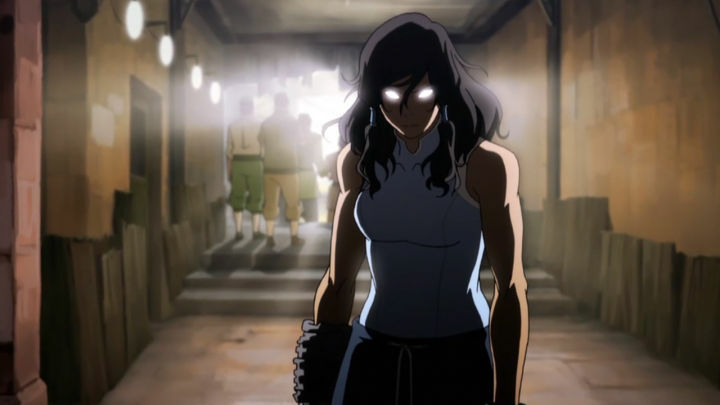 After her fight with Zaheer and the Red Lotus, Korra seems to have lost a part of herself that she can’t just get back and goes back home before traveling the world to rediscover who she is and where her purpose lies. It’s an incredibly heartfelt and relatable story to anyone who has gone down the journey of self-rediscovery…and it’s played out in just 22 minutes of screen time. Bravo. After a few weeks of failed recovery in Republic City, Korra decides to return back to her home in the Southern Water Tribe where she hopes to receive the healing touch of Katara. Before Korra leaves, she’s sent off by Team Avatar with the promise that they’ll all keep in touch via letters. Bolin steals the scene with his typically unwitting charm of the “I can’t wait until your gone” line. Korra journeys back and discovers that even with Katara’s legendary healing powers, it’s going to be a lot of hard work to get back to her prime. During her initial healing session, there’s this great little Kill Bill nod as she’s forced to concentrate on wiggling her toes. It takes over six months before Korra begins to make any real progress and she fails to stay in contact with her closest friends. Korra’s struggle to recover isn’t exactly the happiest batch of scenes to watch, but what really makes these moments stand out is Korra’s interaction with Katara. When Korra tries to give up, Katara challenges her with the likes of Aang’s own trials to accept the fate of his entire civilization. There’s a number of powerful lines in these brief but exceptionally effective moments. After a number of months of recovery, Tenzin and the White Lotus meet Korra in the Southern Water Tribe to test her abilities to see if she’s ready to return. The duel is very reminiscent of the first episode of she show before Korra embarks on her journey for Republic City, but this time she stumbles and fails to pass the test. Even though this isn’t exactly a mark of success, Korra and Tenzin’s interaction makes for some really heart warming stuff. Korra is especially frustrated that the Earth Nation is being rebuilt under the order of Kuvira. After years of living back in the Southern Water Tribe, Korra decides it’s time to head back to Republic City to continue her recovery. She decides to take the journey on her own even leaving Naga behind as she sails the ocean blue. She eventually makes a stop at a port where a restaurant owner recognizes her as the Avatar. He’s apparently made it his business to take snapshots of all of the avatars that have passed through. What a fanboy! This was one of the only real comedic beats this episode and it was oddly reminiscent of foamy mouth guy from the original Last Airbender series. Before Korra splits, she sees an older lady getting robbed. Korra hops into action only to be taken out by the pair of sandbenders who laugh and get away. She’s been practicing and sharpening her skills for a long time, but it looks like she still hasn’t found her mojo. Korra finally makes her way to Republic City which is where she first sees the ghost-like specter of Korra (lets call her Darth Korra) waiting for her on Air Temple Island. She gets a little bit spooked and instead of returning to the city she heads to the Tree of Time in the Spirit World to try and reconnect Raava. The spirits take notice, but don’t seem to recognize Korra aside from one little spirit who still sees through Korra’s new look, but the others are dismissive. Korra continues her journey around the world by looking for Raava in the Si Wong Desert but still finds nothing. Everywhere she goes, she sees glimpses of Darth Korra and can’t escape her feelings of hopelessness and despair. Eventually Korra is tired of searching for answers and running from Darth Korra. She decides to chase the ghost down once and for all. She follows the ghost into the underground earthbending ring where we found her at the end of last episode. After being defeated in the match she finds a dog that can sense Darth Korra too. The dog leads Korra out of town and into a swamp. Once they make to the swamp, the dog reveals itself to be the spirit who recognized Korra in the Tree of Time. He promises that he’s leading her to someone who would like to help her. Darth Korra intervenes and we finally get to see the mano-e-mano fight between our hero and dark dopple ganger, only for our fight to end in a sort of stale mate as Korra is knocked unconscious. The episode ends with one heckavu cliffhanger as Korra wakes up in a dark cave that’s the home of none other than the legendary Toph Beifong! The final line of the episode “Good to see you again Twinkletoes” hit me hard with chills and nostalgia from The Last Airbender series! Korra Alone is a fantastic episode that delivers powerful character moment after character moment and ends with a world of promise as we head into what’s sure to be an incredible final season of the show. Korra’s character arc throughout the show has been one of discovering her truest purpose and this episode seems to have set her on the path of realizing just how important the Avatar is to the world at large. In Book 1 she was forced to confront the idea that bending is evil; in book 2 she had to battle against her powers turned evil, and last season she had to deal with a world ready to move on without a peacekeeper like herself. This season is set on giving her a newfound purpose in this world filled with rapidly evolving technology, politics, and equalists philosophy. Korra has her work cut out for her, but I’m very excited to see how she finds her way in the last 11 episodes. Ever since Toph was referenced as “traveling the earth” last season, I was sure we’d see her again. She’s blind and seems far wiser and more in tune with the spirits than the Toph from the original series. I’m sure this is going to poise her as a sort of “Yoda” figure crucial to Korra’s realizing her purpose. There’s still a number of threads to tie up in the last 11 episodes, but these first two pieces of the puzzle seem more confident and certain of where the story is heading than anything we saw in books 2 and 3. It looks like we’re set for some of the best Avatar yet as Korra Alone puts our heroin back at the front and center of the series’ final push.